The first systematic, scientific study of lightning was conducted, as we all know, by Benjamin Franklin during the second half of the 18th century. Before that, science had evolved to the point that we could separate positive and negative charge. These charges could then be stored in �Leyden Jars�. Leyden Jars were capacitors that could store the charge created by a person rubbing two different materials together. Sparks could then be generated and observed. Although others managed to make the connection between the sparks of the capacitors and lightning, Franklin was the first to actually design an experiment to prove the nature of lightning. He theorized that clouds are electrically charged and, therefore, lightning must be electrical in nature. His original experiment was to stand on an electrical stand and hold an iron rod with one hand so that an electrical discharge between the free hand and the ground would be made. According to his theory, an electrically charged cloud would create sparks that would �jump� between the iron rod and a grounded wire (which he held up with an insulating wax candle). Franklin never successfully completed this experiment. The experiment was successfully completed by at least two other men, however. Thomas Francois D�Alibard of France managed to see sparks jump from the iron rod he was holding in May 1752. A Swedish physicist by the name of G. W. Richmann was working in Russia during July 1753 when he managed to successfully complete this experiment as well. He didn�t get to enjoy his success long, however, as a bolt of lightning struck him dead moments after the success. Benjamin Franklin, on the other hand, thought of a better way to prove his hypothesis. He used a kite in place of the iron rod, since it could get closer to the cloud and it could be flown from anywhere. In 1752, Franklin tied a key to a damp kite string, which was then tied to an insulating silk ribbon wrapped around Franklin�s hand. Sparks were observed to be jumping from the key as Franklin�s grounded body provided a conducting path for the electrical currents that resulted from the strong electric field buildup in the storm clouds. Franklin was also able to measure the sign of the charge delivered through the kite. Thus, Franklin was not only able to show that thunderstorms contain electricity, but also able to infer that the lower portion of the clouds were negatively charged. This was the largest step made in the understanding of lightning until the late 1800s. About this time, photography and spectroscopic tools became available for lighting research. Using more advanced equipment, the researcher Pockels, was able to analyze the magnetic field induced by lightning. This allowed him to accurately estimate the magnitude of the current in a lightning bolt. Similar methods were used by many experimenters throughout the late 19th century. C. T. R. Wilson was the first to use electric field measurements to estimate the structure of the charges during lightning discharges. Wilson�s work made many contributions to our present understanding of lightning, as well as lending us tools to use for modern lightning research. Lightning research was heavily increased in the 1960s. This increase was caused by several things. First of all, lightning posed a great threat to aerospace vehicles and solid state electronic used in computers and other devices (which came into play in the 1960s). Secondly, the research was made easier and better by improved measurement and observational capabilities created by technology. Inside of clouds are small particles known as �hydrometeors�. As these particles grow and interact, the collisions cause them to become charged. After studying these particles, researchers believe that the smaller particles tend to become positively charged while the larger particles become negatively charged. Gravity pulls the larger, negatively charged particles downward, and updrafts tend to send the smaller, positively charged particles upward. The result is that the higher portion of the cloud has a net positive charge while the lower portion of the cloud has a net negative charge. The separation of particles causes a large electrical potential not only within the cloud itself, but also between the cloud and the earth. This electrical potential can become millions of volts in magnitude. Eventually, the electrical resistance in the air breaks down and lightning, the electrical discharge between the regions of the cloud or between the cloud and the ground, is formed. A single lightning �flash� is formed by a series of lightning �strokes�. Usually there are about four strokes per flash. An average duration of time for a stroke of lightning is about 30 microseconds. The average peak power of a stroke of lightning is about 10^12 watts. The electrical discharge, lightning, results in heating up the atmosphere immediately around the lightning strike. The lightning can actually heat the area in the general vicinity to 20,000 degrees C! (This is 3 times the temperature of the surface of the sun). The air that has been heated by the lightning is then compressed. This produces a shock wave, which quickly decays to an acoustic wave as it flows away from where the lightning struck. The flash and the resulting acoustic wave (thunder) that was described in the last paragraph both occur at the same time, so you may be asking �why do I hear the thunder so long after I see the lightning?� The reason is because light travels at 186,000 miles per second, and sound only travels at one one-millionth of this speed (approximately 331 meters per second). Thus, although the lightning and the thunder occur at the same place and time, the thunder will be heard well after the lightning is seen. The further from the lightning you are, the longer the lag time will be. In fact, one way to estimate the distance to a lightning strike is by counting how long it takes to hear the thunder after you see the lightning strike. If you take this result and divide it by 5, you will have an approximation to the distance to the strike (in miles). Cloud-to-ground lightning is by far the most dangerous form of lightning. Although this type of lightning is not the most common type, it is the easiest to research. Therefore, we know the most about cloud-to-ground lightning. Most cloud-to-ground strikes begin near the lower portion of the cloud. As shown below, the lower portion of the cloud is negatively charged. This results in the lightning delivering negative charge to the ground. There are, however, a small percentage of flashes that carry positive charge to the earth. These flashes do not typically occur during the middle of a thunderstorm when there is a �bank� of negative charge between the top, positively charge portion, of the cloud and the ground. Usually, these types of strikes occur when the thunderstorm is dissipating and there are not as many negatively charged particles built up between the top of the cloud and the ground. These flash are also more prominently found during the winter months than during the summer months. This is possibly caused because the cold winter air does not create as many updrafts to lift the smaller, positively charged particles to the top of the cloud. A third way for lightning to cause a net transfer of positive charges to the earth is when there is a tall Earth grounded object. This will be explained in more detail under �Description of Lightning Discharge Processes�. Intra-cloud lightning is by far the most common type. This type of lightning occurs between oppositely charged portions of the same cloud. The flash usually occurs between the positively charged top of the cloud and the negatively charged bottom of the cloud. When intra-cloud lightning occurs, an outside observer, such as you or I standing on the ground, does not normally see more than a flicker of light. This is because the cloud obscures the lightning flash and makes it hard to see. Sometimes, however, portions of the flash will leave the obscuring boundary of the cloud, and a bright channel of light, similar to a cloud-to-ground flash can be seen for miles. This type of lightning is similar to intra-cloud lightning. The only difference is that it occurs between two separate clouds. The discharge is then bridging a gap of clear air, rather than charged particles inside of clouds. The strong electric fields created between the charged particles in the clouds and the on the ground will cause the air to break down. With this initial breakdown, a stream of particles (known as a streamer) may begin to move downward towards the earth. This streamer moves in �steps� of approximately 50 meters per step, and is called a stepped leader. As this streamer moves, it creates an ionized path depositing charge as it goes. As this leader nears the earth, a large potential difference between the leader and the earth is made. Typically, another streamer is launched from the earth when the initial streamer nears the earth�s surface. This second leader shoots up and intercepts the descending leader before it hits the ground. Once a fully connected path has been created by the two leaders colliding, a stroke of lightning returns up the already ionized path at speeds close to that of light. The result of this return stroke is the release of an incredibly large amount of energy, a very bright light, and as explained above, thunder. Sometimes, when a thunderstorm is over a tall Earth grounded object such as a radio antenna, the initial leader may come from the object rather than from the cloud. This then creates a �ground-to-cloud� flash and is the third way for lightning to deliver a net positive charge to Earth that was mentioned above in the section �Cloud-to-Ground Lightning�. This flash can easily be picked out from other flashes because it typically has the branches pointing upward instead of downward. 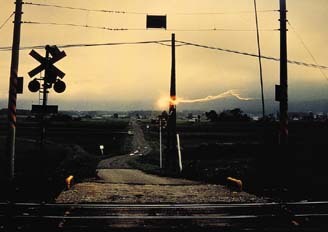 Intra-cloud lightning is created similarly to cloud-to-ground lightning. The main difference between the two is that intra-cloud lightning does not have a return stroke of lightning. This phenomena does not look like "lightning," instead, it appears as a mysterious glowing sphere which drifts through the air. It is typically the size of a grapefruit, but sometimes appears as small as a pea, or as large as a bus. It usually lasts only a few seconds, but sometimes persists much longer. Various colors of "BL" have been seen, sometimes it changes colors, and sometimes it has internal structure. Most researchers agree that it is real, yet its nature is still highly controversial, and no sensible theories yet exist to explain it. Sprites are massive but weak luminous flashes that appear directly above an active thunderstorm. They occur at the same time as cloud-to-ground or intracloud lightning strokes. The structure of a sprite can be small single or multiple vertically elongated spots, spots with faint extrusions above and below or bright groupings. 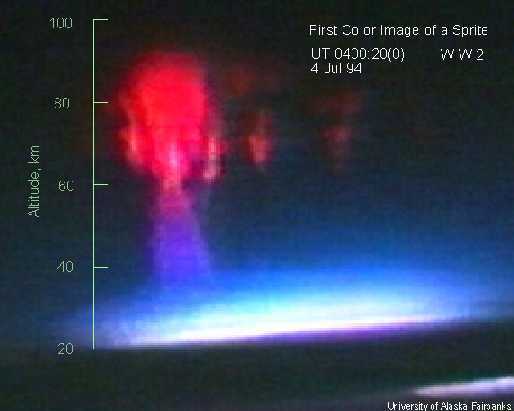 Sprites can extend to altitudes of about 95 km and are most often red. The sprites are rarely seen singly. They usually occur in clusters of two or more. Blue jets are a second phenomena that appear above thunderstorms. These are narrow cones which are ejected from the electrically active core regions of a thunderstorm. Blue jets are typically emitted at speeds of approximately 100 km/s (Mach 300). They then fan out and disappear at altitudes of 40-50 km. A clear view above a thunderstorm is required. This generally means the thunderstorm activity must be on the horizon. Additionally, there must be very little intervening cloud cover. Best viewing distance from storm is 100-200 miles (200-300 km). At these distances sprites will subtend a vertical angular distance of 10-20 degrees. This is 2-4 times the separation of the pointer stars in the Big Dipper. Eyes must be completely dark adapted. Use same criteria for this as for astronomical observing. If you can see the Milky Way, then it is probably dark enough and the eyes have adapted enough to see sprites. Fix your gaze on the space above an active thunderstorm. Do not be distracted by underlying lightning activity in the storm. Block out the lightning if necessary using a piece of dark paper in such a way as to still being able to view what is going on above the cloud. Sprites will be very brief flashes just on the edge of perceptability. They occur too quickly to follow with the eyes, but their strange vertically striated structure and dull red color may be perceived. Patience will be rewarded. If the right kind of storm is present and one's viewing geometry is favorable, then there is a greater likelihood of seeing a sprite than of seeing a shooting star or comet. 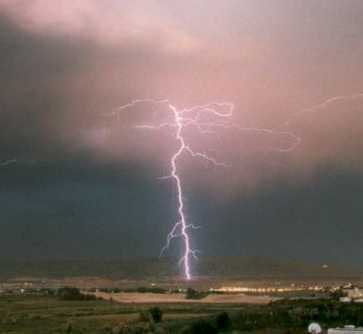 1) Average Lightning Stroke is 6 miles long. 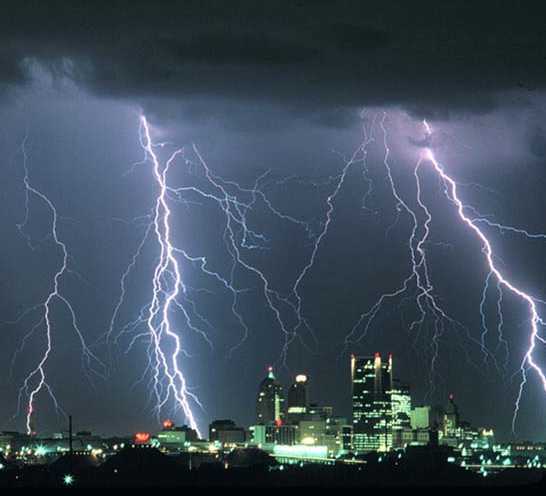 2) The Temperature of lightning's return stroke can reach 50,000 degrees Fahrenheit. The surface of the sun is not even that hot! (around 11,000 degrees Fahrenheit). 3) Once the leading edge of a thunderstorm approaches to within 10 miles, you are at immediate risk due to the possibility of lightning strokes coming from overhanging anvil cloud. Because of this, many lightning deaths and injuries occur with clear skies directly overhead. 4) On average, thunder can only be heard over a distance of 3-4 miles, depending on humidity, terrain and other factors. 5) Average thunderstorm is 6-10 miles wide. 6) Average thunderstorm travels at a rate of 25 mph. 7) Each flash contains about one billion joules of electricity. That's enough energy to light a 100 W light bulb for three months. 1) Stay indoors, and don't venture outside, unless absolutely necessary. 2) Stay away from open doors and windows, fireplaces, radiators, stoves, metal pipes, sinks, and plug-in electrical appliances. 3) Don't use plug-in electrical equipment like hair driers, electric toothbrushes, or electric razors during the storm. 4) Don't use the telephone during the storm. Lightning may strike telephone lines outside. 5) Don't take laundry off the clothesline. 6) Don't work on fences, telephone or power lines, pipelines, or structural steel fabrication. 7) Don't use metal objects like fishing rods and golf clubs. Golfers wearing cleated shoes are particularly good lightning rods. 8) Don't handle flammable materials in open containers. 9) Stop tractor work, especially when the tractor is pulling metal equipment, and dismount. Tractors and other implements in metallic contact with the ground are often struck by lightning. 10) Get out of the water and off small boats. 11) Stay in your automobile if you are traveling. Automobiles offer excellent lightning protection. 12) Seek shelter in buildings. If no buildings are available, your best protection is a cave, ditch, canyon, or under head-high clumps of trees in open forest glades. 13) When there is no shelter, avoid the highest object in the area. If only isolated trees are nearby, your best protection is to crouch in the open, keeping twice as far away from isolated trees as the trees are high. 14) Avoid hilltops, open spaces, wire fences, metal clotheslines, exposed sheds, and any electrically conductive elevated objects. 15) When you feel the electrical charge -- if your hair stands on end or your skin tingles -- lightning may be about to strike you. Drop to the ground immediately. For more information on how to avoid being struck by lightning click here.